I feel a little late to the party having only just finished reading Daniel T Willingham’s Why Don’t Students Like School. The book was released in 2009, and every new page seemed to add relevance to dozens of blogs I’ve read over the past couple of years. For this reason, I’m sure that the book has been widely read -it certainly appears to have influenced a lot of people’s thinking. For those of you who haven’t read it, the author is a Cognitive Scientist, and throughout the book he gives a huge range of information about how the brain works, with practical advice about the implications for teachers. One of the central messages from the book is that what we think most carefully about is what we a re most likely to learn. What follows now are my thoughts, as an English teacher, about how the messages from this book should alter the way I think about teaching. After all, the more I think about it, the more I’ll remember it. 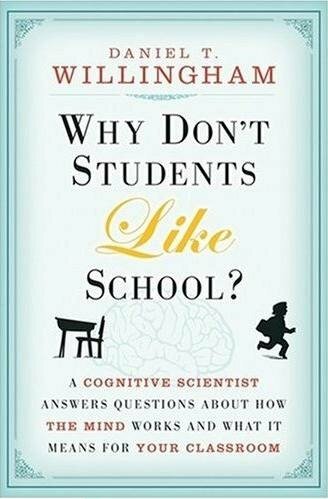 In chapter one, Willingham explains that students find school difficult partly because the brain spends a lot of this time helping us not think, so that that we can do things automatically. Although I’d never thought of this before, it does seem to explain why I can wake up, get ready for school, and drive to school, without any real thought. So, our brains are not necessarily designed to help thinking, but to avoid it. But, and this is the crucial but, we enjoy thinking when there is a problem to be solved. In Willingham’s terms, a problem can be any task which can requires though that can succeed. Even though we avoid thinking when possible, we are naturally curious, and as a teacher this is something I need to exploit. Do all my lessons provide a clear cognitive task, be it a problem or a question, which can be solved? Which of my students will stop thinking about this problem because it is too hard, or too easy? If students are busy working, is my task designed clearly enough so it still requires thinking about this problem, or is the task/activity distracting? As an English teacher, I’m occasionally guilty of presuming that if my students can analyse a poem, they will be able to transfer this knowledge to analysing other texts. However, any skill like ‘analysis’ is bound together with knowledge, which makes the task of analysing a poem or novel reliant on different background knowledge, which must be addressed. Even for reading comprehension, the evidence suggests that knowledge about the topic supports student’s comprehension. Similarly, critical thinking and a skill like analysis also requires background knowledge, as this style of thinking is heavily reliant on using things you already know to help. Again, there are huge implications for my teaching here. When I introduce texts, how can I ensure students have the requisite background knowledge to think critically about these texts? What texts come with the most useful and important background knowledge? When we’re writing, how can I provide a useful body of knowledge for students to develop their own writing? If background knowledge helps students read and think critically, should I choose texts based on what my students already know a lot about? Actually, no. Not only would this give me the difficult problem of trying to match some very diverse interests, Willingham also demonstrates how even content the students find ‘interesting’ can be boring, and even distracting. For instance, if teach a lesson on analysing vocabulary choices, using an album review from One Direction album review, are my students thinking about vocabulary, or One Direction’s latest album? Are they likely to focus on vocabulary, or just think about whether they like or dislike the group? Is my lesson completely centered on getting the students to think carefully about the meaning of what I intend them to learn? Does my choice of activities or tasks support this thinking, or might it distract from it? When choosing a text to study, is it meaningful enough to make it worthwhile thinking about? Have I organised my lessons using a clear story structure (where appropriate)? Can I utlilise the idea of conflict support my students’ thinking? Does the entire curriculum have a useful structure, which might resemble a clear story of English? The ‘One Direction’ example demonstrated the difficulty with presuming students can transfer the skill of ‘analysis’ between different texts. Part of the problem is that this transference requires students to think about the deeper structure of problems, not the surface structure. With my previous example, the surface structure of the problem might be regarding a successful pop band, whereas the deep structure was to get students questioning the writer’s vocabulary choices. And, Willingham explains, we prefer to think in concrete terms, so being able to abstract the skill of analysis across different examples is actually very cognitively challenging. As experts in their field, a teacher might easily be able to identify deep structures, making links between new problems and ones they’ve encountered previously. For novices, this is much more difficult. To help students improve at transferring skills, I need to think carefully about how I make sure the deep structure is the main focus of our thinking. I also need to have a range of examples up my sleeve which get students thinking about similar examples they already know about. Analogies which relate prior knowledge to new contexts may also be useful. In short, understanding all new ideas must involve relating back to what we already know. Do I revisit old examples enough, to help my students understand new ideas? Does my planning support students in being able to remember these old ideas, or do we ‘learn’ them, move on and forget them? Is the ‘deep structure’ of problems the focus in my lessons? Is the curriculum designed carefully, so that examples which help my students focus on the deep structure of problems and tackle new, more challenging examples? So, with all these questions in mind, what’s the best way of actually getting students to remember stuff, really remember it? Because it seems like the more students remember, the easier it will be for them to learn knew things. Unsurprisingly, practice is key here, and Willingham makes it clear that extended practice is necessary to master any thinking task. Practice also helps students transfer knowledge to new situations. This sounds pretty obvious, but I still think sustained practice might be something I overlook. Do I provide enough opportunity for sustained practice? Do I move on to a new topic when students have mastered what I want them to, or because it’s half term? Do I know which processes in English need to be practised enough to be almost automatic? How should I deign this practice to give students the chance to recall their learning at various stages in the future? Perhaps the most important aspect of this book is the clarity in which it shows that the knowledge-rich are much better placed to become knowledge-richer. So those who join schools having less knowledge, for whatever reason, are less likely to develop. But, we can take solace in the fact that intelligence can be changed through sustained hard work. This fits quite nicely with the zeitgeist. Grit, growth mindset, whatever you want to call it, hard work can make students more intelligent. What does this mean for the students who’ve fallen behind? It means that they can catch up, but will have to work bloody hard to do so. How can I convince learners that effort leads to improvements? How can I instill a culture whereby hard work is valued over current ability? How can I make sure those who might be use to failing, seek to challenge themselves, which might necessarily lead to more failure? Willingham finishes his book by shifting the focus from the minds of students to the minds of teachers, with the conclusion that actually they’re fairly similar. Like any complex skill, teaching can be improved through practice, like our students, we can get better with practice. What I find most interesting about this chapter is the distinction he makes between experience and practice. Whilst experience might be doing similar things, day in day out, until you’re fairly comfortable with your levels of proficiency, practice involves consciously trying to improve your performance. It’s also difficult, requiring hard work, time, of which we have precious little, and the support of your colleagues in providing useful feedback and critique. How will I ensure that I find the time, and put the effort into conscious practice of my teaching, so that I can continue to improve? I work for the Edge Foundation and have a press release that might be of interest to you with regards to the VQ Day Awards 2014 and their new Teacher Award. Drop me and email and I’ll send it over to you!